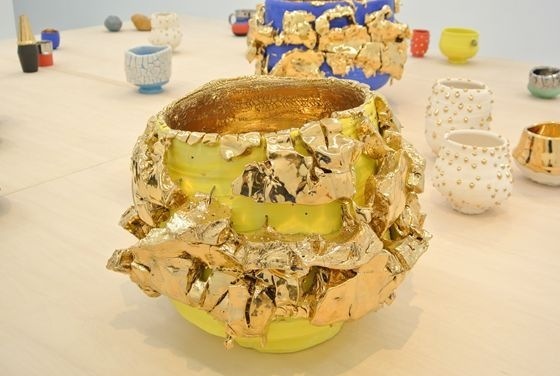 Takuro Kuwata is a young artist who works in ceramics. He has developed his own style originally starting from traditional techniques. During the interview, he shared his ideas behind joyful colors, forms and materials which distinguish him from traditional ceramic art. His works are powerful and happy. He respects and enjoys the power of nature by bringing its characters directly into his work. 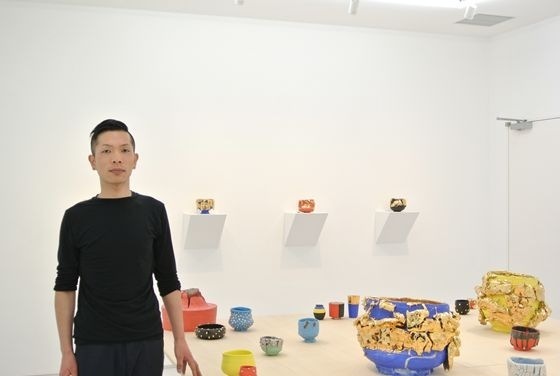 Artist Takuro Kuwata standing in the gallery among pieces of his art. 8/ ART GALLERY/ Tomio Koyama Gallery. - Bright colors are impressive. What made you to use these colors? I simply love bright colors. I love Northern European furniture and London’s tube (underground metro system) of their colors. Signatures or sheets of the London underground system are very bright and use only strong and radiant colors. Working with this kind of colors makes me feel good and the emotions that come from this kind of creation make people and me feel very joyful. In addition to that, I wanted to add some heartfelt creation in my work. I love Northern European designs but I thought it would be interesting to add some hand-made feelings. That is how I gradually developed my style. In traditional Japanese ceramics, bright colors were used to decorate or draw a figure on ceramics as an accent. 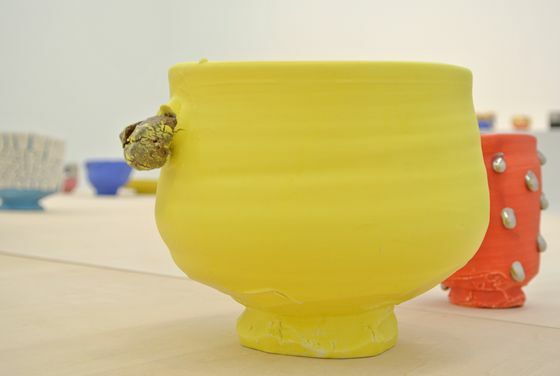 Using bright colors on the entire ceramics has never been done before. One old American ceramic artist who used to know the maestro Shoji Hamada, said to me that my work is “simple”. I was surprised since I haven’t been said like that before. She praised me as she was shocked to see how simply I use colors in my work and that was something she had never seen before. Colors are usually used to decorate ceramics but I used it on the entire surface. She praised it as a simple and succinct idea. 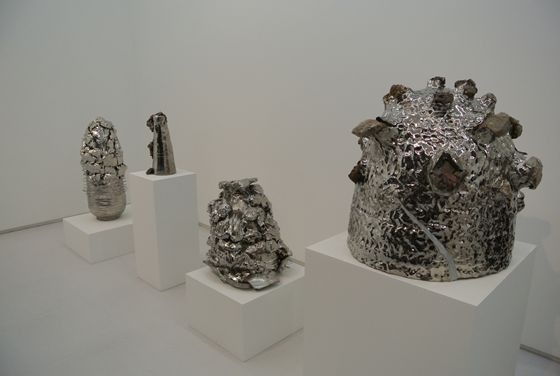 Works by Takuro Kuwata. Gold is like dripping out of the cup. -Metallic colors are also interesting to be used in ceramic. The gold part is colored by using the same method as European ceramic does, such as handles of Wedge-wood’s cups. There are some traditional methods to use gold in Japan as well, but the gold color is not glittering compared to the European one. I wanted to use a glittering gold in my work. Beside of being just colorful, I fundamentally aim to create a work which the viewer feels “something” from it. I want them to lean in to see my work questioning “What’s this?!”. 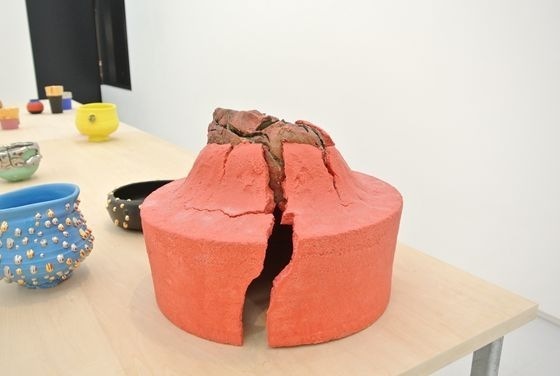 Takuro Kuwata applies feldspar glaze to cover. During firing, it falls and cracks, adding the tension and natural effect of unevenness in his ceramics. 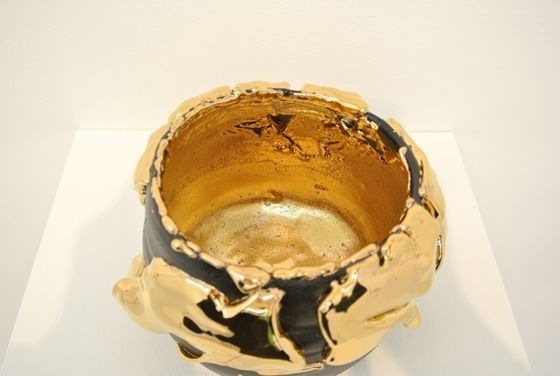 Another work by Takuro Kuwata. 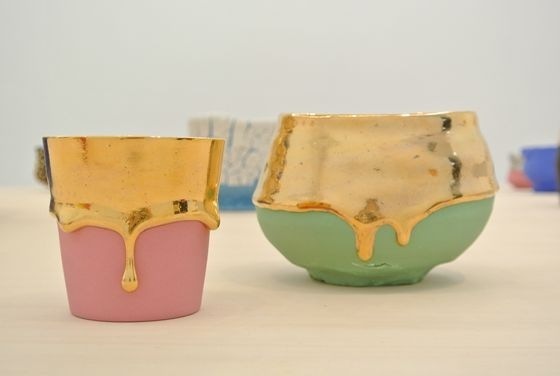 Covered with uniquely cracked gold glaze. -How did you get an idea of these cracks? I love traditional ceramics and visited the exhibition by Toyozo Arakawa who is a national living treasure in Japan and famous for his techniques of Shino-yu (technique to put thick white glaze covered on the surface of ceramics). At the exhibition, there was a water vase created by using Shino-yu technique. When I saw that work, I found its edge was slightly coming off. I got deeply interested in that part and decided to try Shino-yu in my work. As I worked on, I covered the glaze thicker and thicker. There are many works using the same glaze in the past, but mine is specially thick. 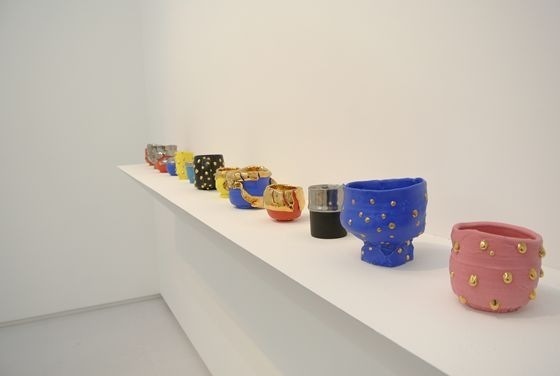 Tea cups by Takuro Kuwata lined in the exhibition space. -Why did you choose ceramics as your medium? I chose ceramics since I don’t have to plan precisely in the beginning like designing products. It has more freedom to change ideas and create a shape with my intuition. I thought that process suits to my personality. 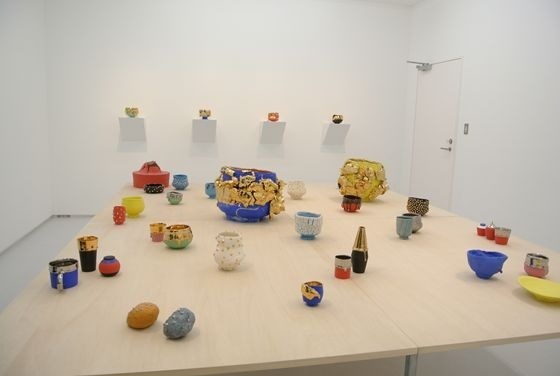 I was apprenticed to Mr. Susumu Zaima and got addicted to ceramics. I didn’t even know the differences of each materials in the beginning and my works were similar to my master’s. However, gradually, I start to think of combining what I like and my techniques to develop my own work. Ceramics can’t be created as I planed first and that is the interesting part. Glazes will crack and stones will be broken unexpectedly. On the other hand, there is a way to see that unexpected happenstance as an accent of the work. -How were your influenced by your master, especially? My master was living a slow life in a calm rural area. Sometimes, he said “Let’s go to a cafe and have some coffee.” After a cup of coffee, we got ashes from the stove of the cafe and bring it back to blend it into our glaze. We brought stones from a mountain all by ourselves. Those experiences influenced me a lot. I was surprised to see how the material that I got changed its appreance. It is boring to see an expected result. I enjoy the happentance brought from nature. -This work (above) is interesting. Is it a stone? The center part is a stone. When it’s fired in a kiln under a very high temperature, the stone swells. If you put it for a longer time, it cracks. How the stone swells or cracks differs from stone to stone. And that’s really exciting to me. I take it out from the kiln when it swelled. But actually, I can’t visually see it from the outside of the kiln which has no window. I guess it from the temperature and my experience. Even the stone looks like the one I fired before, some stones have different internal compositions and it ends up with an unexpected result. Sometimes, I fired too much and broken stones flied apart inside the kiln. 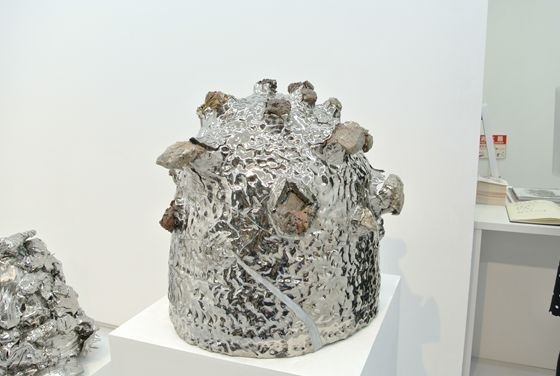 Work by Takuro Kuwata. Small stone is almost like falling down. 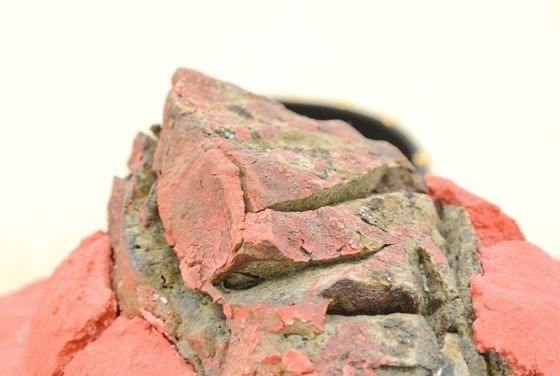 -Is it common to include a stone in a ceramic work? There is a technique called “ishi-haze“. 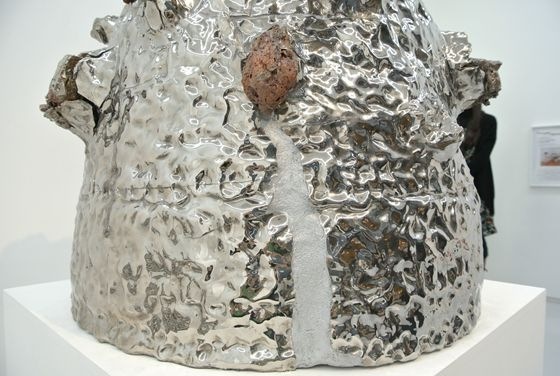 It originally happened as an accident that a little stone included in a ceramic work unconsciously. The old tea ceremonist saw that stone as an interesting accent in the work. Then, “ishi-haze” became one of the traditional techniques. When I was in college, I found how interesting the stone changes when it is fired. I started to fire small stones to see how they will change in my work. Then, I started to use larger stones. Moreover, I like to put stones in my work since it gives a feeling of strangeness. A stone is placed on this tea cup which is has a purpose to use for drinking. People may say “Why is it placed here? !” I like to provide that kind of surprise. In addition to that, I like the feeling of nature or in other words, the nature’s energy that can be felt. The energy of a stone. -How do you differentiate your larger works to the smaller ones? Smaller pieces usually have a purpose to be used such as tea cups or vases and I try to put a strange sense in it. On the other hand, for the larger pieces, I play with the features of glazes and stones by exaggerating them. I get ideas when I am working on smaller pieces and bring it into a larger piece, sometimes, vice versa. There was a large crack in the middle part and filled in afterwards, just like “Kin-tsugi” which is a traditional method fill in the tiny crack of a bowl. - I’ve heard that you listen to music when you work. Yes, some time ago I did, but now I don’t anymore. When I did, I wanted the music to push my back to concentrate in creation. I listened mostly to Hip Hop and R n’ B, because when I was younger, I did a lot of street dancing. -How do you come up with these great new ideas? Ceramics are unpredictable. It’s hard to expect how it will be like until I take it out from the kiln. Fundamental features of each glaze can be learned from traditional lessons. I develop each glaze’s characters by changing the conditions such as the temperature or the amount of combinations. I learn how each glaze will behave under a new condition. Color changes and stones crack unexpectedly. I remember each result and put them in my idea box. Then, I mix up each features in my new work. -When you made several bowls with the same method, how do you judge whether it is good or bad? Sometimes, ten works out of ten are good while only one out of ten made me satisfied. I think I choose the work with my intuition. It may be similar to what you choose for your lunch today. But I try to think of why I chose it afterwards. It is important to know what I cared at that moment. Even if it looked not good, I don’t throw it away, put time and review it later on since it sometimes gives me an idea for a new work. Exhibition space is also related to what I choose as an appropriate work. For example, more winding work may match to some specific places. -Your works are perfectly fitting in this gallery space. Looking forward to seeing how your works will develop in the future. His work is bright and happy and it radiates the joy not only of the product, ceramic itself but also the joy of making it. His idea of art is very unique and interesting, mostly because he focuses on what kind of energy and emotion the art radiates and he tries to accomplish this with the usage of different natural materials. The simplistic and natural look is what he mostly what he is tending towards. Interviewed on Feb 7th 2013, text by Katja Šifkovič.